Designed to operate in the harshest environments, providing >350 W of cooling to a circulating coolant in a compact, lightweight package. 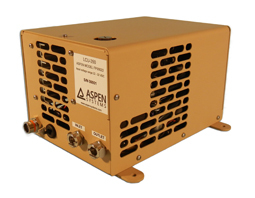 Aspen developed this liquid chiller unit for several customers who expressed a need for a compact, lightweight liquid chiller which would meet the environmental stresses of the harshest environments while still provided sufficient cooling or heating. The system has both heating and cooling capabilities and circulates thermally regulated (+/- 0.5°C) coolant to a customer cold plate or heat exchanger. The system has a built-in pump and reservoir to circulate the coolant, which allows system to function without the use of a fill kit. The system also has a communication port which allows the user to monitor the system performance and choose the operating temperature. The compact design gives the user flexibility to design this chiller into their system or have is reside as a separate unit. Also, the cold plate, which ultimately removes heat from the payload, can exist remotely from the chiller and can be designed as appropriate.